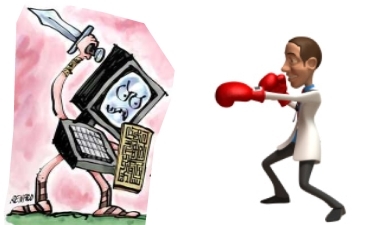 Artificial Intelligence Versus the Scientist: Who Will Win? Will DARPA Replace the Human Scientist: Not So Fast, My Friend! our research methods force us to focus on little parts. The Big Mechanisms project aims to design computer algorithms to critically read journal articles, much as scientists will, to determine what and how the information contributes to the knowledge base. One team is focused on extracting details on experimental procedures, using the mining of certain phraseology to determine the paper’s worth (for example using phrases like ‘we suggest’ or ‘suggests a role in’ might be considered weak versus ‘we prove’ or ‘provide evidence’ might be identified by the program as worthwhile articles to curate). Another team led by a computational linguistics expert will design systems to map the meanings of sentences. Integrate each piece of knowledge into a computational model to represent the Ras pathway on oncogenesis. Produce hypotheses and propose experiments based on knowledge base which can be experimentally verified in the laboratory. The Human no Longer Needed? : Not So Fast, my Friend! Notice this verification step (step 3) requires physical lab work as does all other ‘omics strategies and other computational biology projects. As with high-throughput microarray screens, a verification is needed usually in the form of conducting qPCR or interesting genes are validated in a phenotypical (expression) system. In addition, there has been an ongoing issue surrounding the validity and reproducibility of some research studies and data. Therefore as DARPA attempts to recreate the Ras pathway from published literature and suggest new pathways/interactions, it will be necessary to experimentally validate certain points (protein interactions or modification events, signaling events) in order to validate their computer model. Manual or automated curation of scientific literature? Biocurators, the scientists who painstakingly sort through the voluminous scientific journal to extract and then organize relevant data into accessible databases, have debated whether manual, automated, or a combination of both curation methods  achieves the highest accuracy for extracting the information needed to enter in a database. Abigail Cabunoc, a lead developer for Ontario Institute for Cancer Research’s WormBase (a database of nematode genetics and biology) and Lead Developer at Mozilla Science Lab, noted, on her blog, on the lively debate on biocuration methodology at the Seventh International Biocuration Conference (#ISB2014) that the massive amounts of information will require a Herculaneum effort regardless of the methodology. Although I will have a future post on the advantages/disadvantages and tools/methodologies of manual vs. automated curation, there is a great article on researchinformation.info “Extracting More Information from Scientific Literature” and also see “The Methodology of Curation for Scientific Research Findings” and “Power of Analogy: Curation in Music, Music Critique as a Curation and Curation of Medical Research Findings – A Comparison” for manual curation methodologies and A MOD(ern) perspective on literature curation for a nice workflow paper on the International Society for Biocuration site. The Big Mechanism team decided on a full automated approach to text-mine their limited literature set for relevant information however was able to extract only 40% of relevant information from these six paragraphs to the given model. Although the investigators were happy with this percentage most biocurators, whether using a manual or automated method to extract information, would consider 40% a low success rate. Biocurators, regardless of method, have reported ability to extract 70-90% of relevant information from the whole literature (for example for Comparative Toxicogenomics Database)[3-5]. In an earlier posting (actually was a press release for our first e-book) I had discussed the problem with the “data deluge” we are experiencing in scientific literature as well as the plethora of ‘omics experimental data which needs to be curated. Figure. 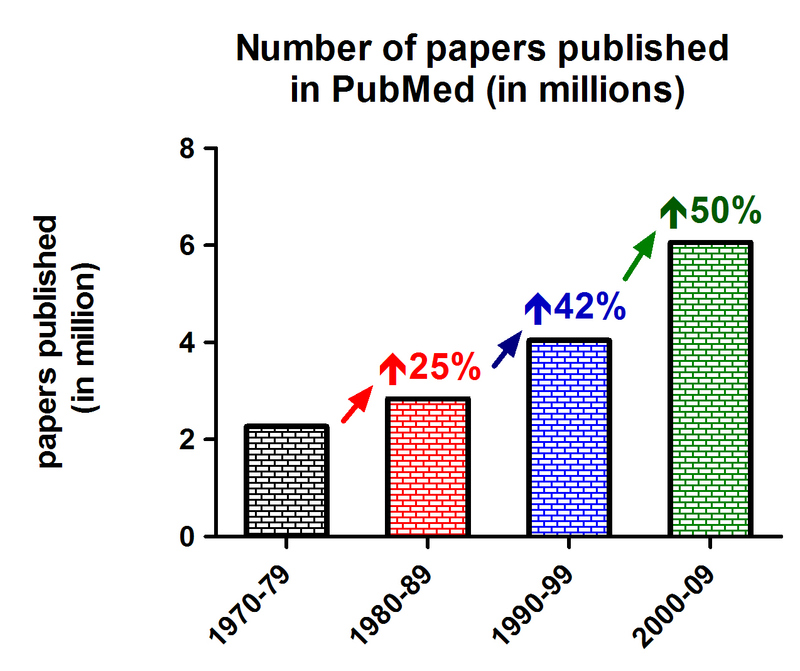 The number of papers listed in PubMed (disregarding reviews) during ten year periods have steadily increased from 1970. Traditionally, organization of biomedical information has been the realm of the literature review, but most reviews are performed years after discoveries are made and, given the rapid pace of new discoveries, this is appearing to be an outdated model. In addition, most medical searches are dependent on keywords, hence adding more complexity to the investigator in finding the material they require. Third, medical researchers and professionals are recognizing the need to converse with each other, in real-time, on the impact new discoveries may have on their research and clinical practice. These issues require a people-based strategy, having expertise in a diverse and cross-integrative number of medical topics to provide the in-depth understanding of the current research and challenges in each field as well as providing a more conceptual-based search platform. To address this need, human intermediaries, known as scientific curators, are needed to narrow down the information and provide critical context and analysis of medical and scientific information in an interactive manner powered by web 2.0 with curators referred to as the “researcher 2.0”. This curation offers better organization and visibility to the critical information useful for the next innovations in academic, clinical, and industrial research by providing these hybrid networks. 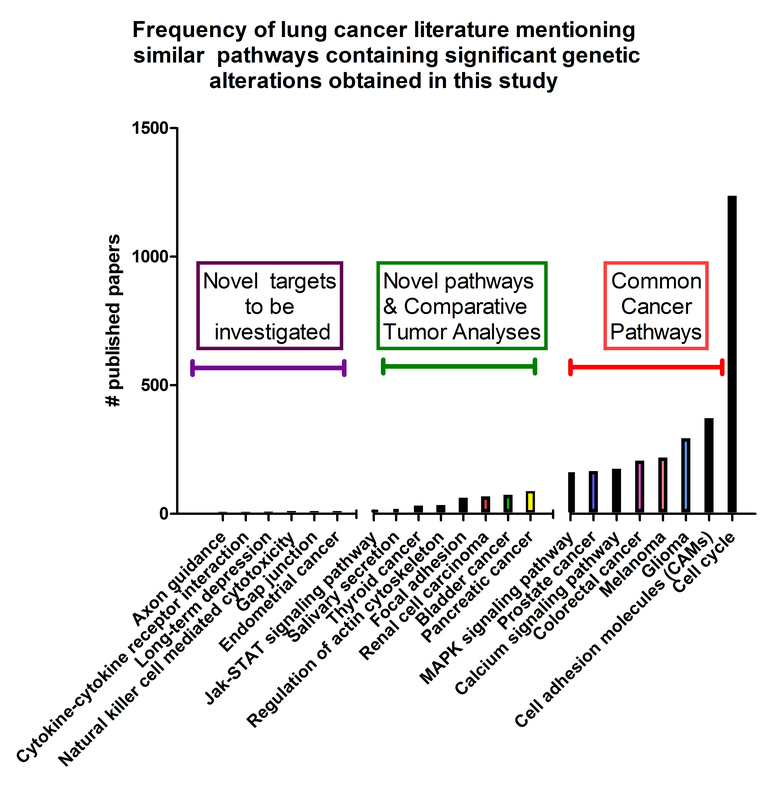 which showed, that while multiple genetic mutations and related pathway ontologies were well documented in the lung cancer literature there existed many significant genetic mutations and pathways identified in the genomic studies but little literature attributed to these lung cancer-relevant mutations. This ‘literomics’ analysis reveals a large gap between our knowledge base and the data resulting from large translational ‘omic’ studies. A ‘literomics’ approach focuses on what we don NOT know about genes, proteins, and their associated pathways while a text-mining machine learning algorithm focuses on building a knowledge base to determine the next line of research or what needs to be measured. Using each approach can give us different perspectives on ‘omics data. Ras is one of the best studied and characterized oncogenes and the mechanisms behind Ras-driven oncogenenis is highly understood. This, according to computational biologist Larry Hunt of Smart Information Flow Technologies makes Ras a great starting point for the Big Mechanism project. As he states,” Molecular biology is a good place to try (developing a machine learning algorithm) because it’s an area in which common sense plays a minor role”. Then it is possible to design an inference system using calculus that tells the investigator what they need to measure. To watch a video of Dr. Judea Pearl’s April 2013 lecture at Microsoft Research Machine Learning Summit 2013 (“The Mathematics of Causal Inference: with Reflections on Machine Learning”), click here. The key for the Big Mechansism Project may me be in correcting for the variables among studies, in essence building a models system which may not rely on fully controlled conditions. Dr. Peter Spirtes from Carnegie Mellon University in Pittsburgh, PA is developing a project called the TETRAD project with two goals: 1) to specify and prove under what conditions it is possible to reliably infer causal relationships from background knowledge and statistical data not obtained under fully controlled conditions 2) develop, analyze, implement, test and apply practical, provably correct computer programs for inferring causal structure under conditions where this is possible. In summary such projects and algorithms will provide investigators the what, and possibly the how should be measured. So for now it seems we are still needed. You J: Artificial intelligence. DARPA sets out to automate research. Science 2015, 347(6221):465. Davis AP, Johnson RJ, Lennon-Hopkins K, Sciaky D, Rosenstein MC, Wiegers TC, Mattingly CJ: Targeted journal curation as a method to improve data currency at the Comparative Toxicogenomics Database. Database : the journal of biological databases and curation 2012, 2012:bas051. Wu CH, Arighi CN, Cohen KB, Hirschman L, Krallinger M, Lu Z, Mattingly C, Valencia A, Wiegers TC, John Wilbur W: BioCreative-2012 virtual issue. Database : the journal of biological databases and curation 2012, 2012:bas049. Wiegers TC, Davis AP, Mattingly CJ: Collaborative biocuration–text-mining development task for document prioritization for curation. Database : the journal of biological databases and curation 2012, 2012:bas037. Researchers from Cornell University will develop microphysiological modules to model the nervous, circulatory and gastrointestinal tract systems. Cornell’s Michael Shuler has received National Institutes of Health (NIH) funding to make 3-D chips with living cells and tissues that model the structure and function of human organs and help predict drug safety. Shuler, the James and Marsha McCormick Chair of the Department of Biomedical Engineering, and James Hickman of the University of Central Florida (UCF) jointly received one of 17 NIH grants for tissue chip projects. Shuler and Hickman’s grant of approximately $9 million over five years includes subcontracts to UCF, RegenMed, GE, Sanford-Burnham and Walter Reed Army Institute. It will support their work in microphysiological systems with functional readouts for drug candidate analysis during preclinical testing. The researchers also plan to build a 10-organ system designed to be low-cost yet highly functional to use in drug discovery, toxicity and preclinical studies. With the funds, the NIH is supporting bio-engineered devices that will be functionally relevant and will accurately reflect the complexity of a particular tissue, including genomic diversity, disease complexity and pharmacological response. The NIH tissue chip projects will be tested with compounds known to be safe or toxic in humans to help identify the most reliable drug safety signals — ultimately advancing research to help predict the safety of drugs in a faster, more cost-effective way. 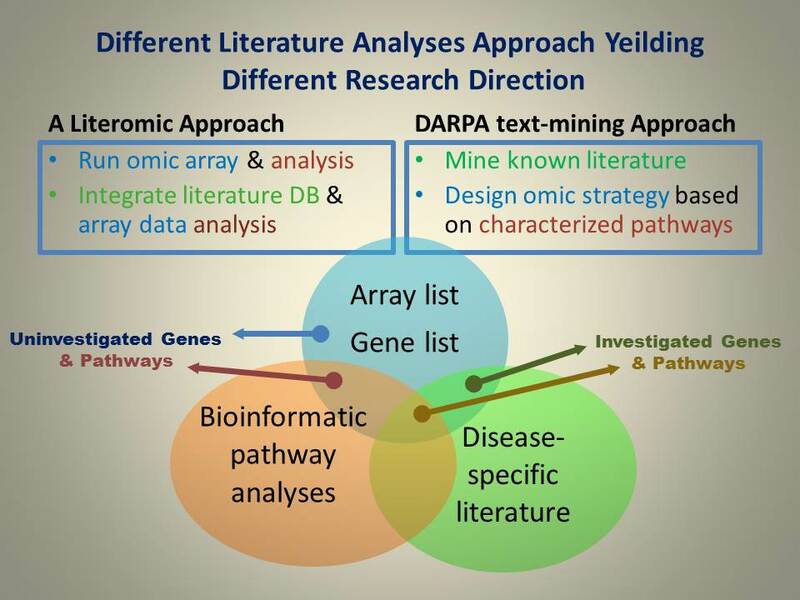 DARPA and FDA to collaborate on therapeutic development initiative. Seventeen National Institutes of Health grants are aimed at creating 3-D chips with living cells and tissues that accurately model the structure and function of human organs such as the lung, liver and heart. Once developed, these tissue chips will be tested with compounds known to be safe or toxic in humans to help identify the most reliable drug safety signals – ultimately advancing research to help predict the safety of potential drugs in a faster, more cost-effective way. The initiative marks the first interagency collaboration launched by the NIH’s recently created National Center for Advancing Translational Sciences (NCATS). Tissue chips merge techniques from the computer industry with modern tissue engineering by combining miniature models of living organ tissues on a transparent microchip. Ranging in size from a quarter to a house key, the chips are lined with living cells and contain features designed to replicate the complex biological functions of specific organs. NIH’s newly funded Tissue Chip for Drug Screening initiative is the result of collaborations that focus the resources and ingenuity of the NIH, Defense Advanced Research Projects Agency (DARPA) and U.S. Food and Drug Administration. NIH’s Common Fund and National Institute of Neurological Disorders and Stroke led the trans-NIH efforts to establish the program. The NIH plans to commit up to $70 million over five years for the program. “Serious adverse effects and toxicity are major obstacles in the drug development process,” said Thomas R. Insel, M.D., NCATS acting director. More than 30 percent of promising medications have failed in human clinical trials because they are determined to be toxic despite promising pre-clinical studies in animal models. Tissue chips, which are a newer human cell-based approach, may enable scientists to predict more accurately how effective a therapeutic candidate would be in clinical studies. On August 18, 2012, I needed scientific inspiration. To nurture my imagination I surf on http://www.mit.edu for 4 hours. Comment, Please. Protein that boosts longevity may protect against diabetes: Sirtuins help fight off disorders linked to obesity, new MIT study shows.